Papercraft: Make a Lorenzburg hand flag! Mythoglyphicon – Lorenzburg’s ancient alphabet! Do you represent the Sciences or Enterprises? First batch of velvet mouches from the Princely Perfumery of Lorenzburg! The first batch of fragrant velvet mouches from the Princely Perfumery has arrived! Now, anyone can delight in the elegance and court culture of Lorenzburg’s history! We will soon open a shop where one can purchase souvenirs, flags and, of course, velvet beauty patches from the Princely Perfumery! In ancient days sumptuary laws regulated how many of the little decorative velvet patches someone was allowed to wear. Commoners could use only one, while higher status people could use more according to their various ranks. On one historical occasion there was a peasant uprising that manifested in a Mouche Law Defiance. Members of the peasant class would show up sporting spots all over their faces. The uprising lasted a few days and resulted in some reforms, however the sumptuary laws, even though no one follows them anymore, where never formally abolished. The Master or Mistress of the Mouche has multiple duties in the realm. 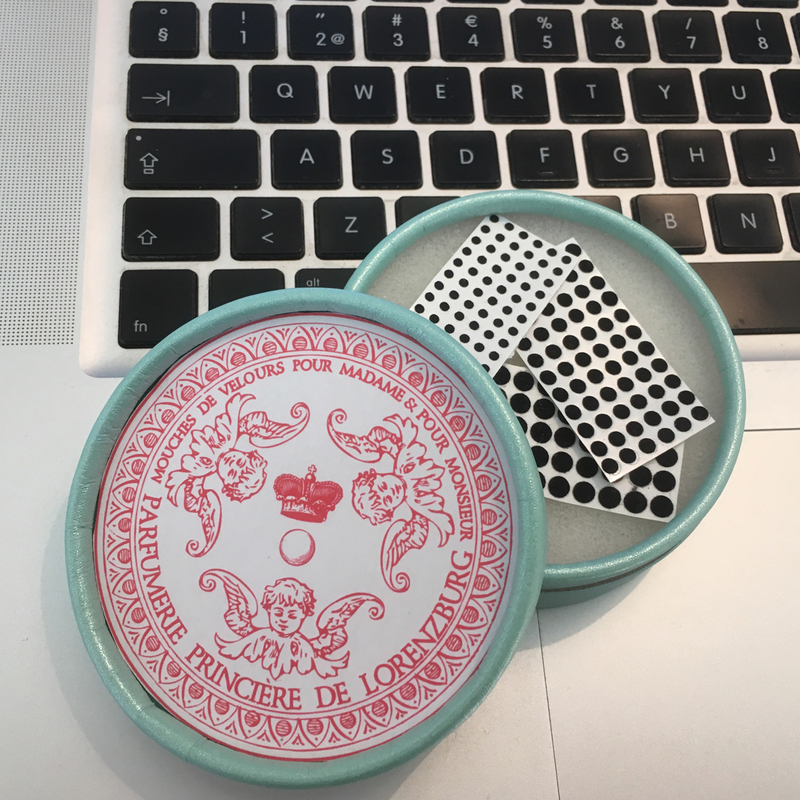 They are the official that administers the beauty mark(s) to the reigning Prince’s face and they are also the custodian of the “Princely Mouche” – tiny perfumed velvet patches in a little wooden box called the Pyx (from the greek word “Boxwood”). Another of the duties of the Master of the Mouche is to oversee that the Law-of-Mark, i.e. the laws regulating rank and mouche privileges, is followed. Argent, ten pellets (roundels Sable) arranged four over three over two over the one. The shield is crowned with a Princely hat. Next Next post: Happy Midsummer’s Eve from Lorenzburg! Write your email adress in order to get updates to your inbox. As per the new law 2018 for saving data: please be informed that we must use save and use your email adress in order for the subscription to work.